Q: Why don’t you have a recipe yet for Koegel’s Flint coney sauce? A: Not to put too fine a point on it, there’s no such thing. The Flint Coney sauce Koegel’s distributes is Abbott’s Original Flint Coney Sauce, which we do have a copycat recipe for (below). 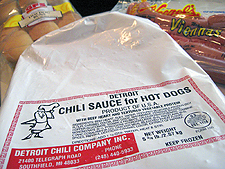 They also carry two other products; their Hot Dog Chili Sauce, which is specifically a Detroit Style Coney Sauce, and their Chili Topping, which is more of a Chili Con Carne and does not include beef heart as the Flint, Detroit, and Jackson coney sauces do. There is no such thing as a single restaurant recipe for Flint Coney sauce. Here’s how it works: Abbott’s Meat provides a 25# bag of sauce base to the restaurants, consisting of finely-ground beef heart with soy texture, about an 80/20 blend of the two. That product is the foundation for each restaurant’s individual recipe for the sauce. How it’s used is why there are so many minor variations in flavor. The restaurant will sauté chopped onions in rendered beef suet (aka “beef tallow”) or, in some cases, butter or vegetable oil, dump in the contents of the 25# bag from Abbott’s, simmer it for a good hour or more until it’s browned and broken up quite fine, then add good amounts of cumin and chili powder (generally about 8 ounces each), maybe some savory Spanish paprika (not Hungarian, which is sweet paprika), and whatever else they’d like. This is why all the sauces look the same but have flavor differences. The Abbott’s Coney Sauce described and show on the “What Is It?” page on this site, available in 4# and 10# bags from the link in the above note, is a very recent development, and most restaurants don’t use it. This is our collection of almost every version of the Flint Coney sauce recipe we’ve been able to locate. The recipes here have all been tested, and are provided with development notes and photos. Other recipes, such as the “Coney Island Sauce” recipe from “Two to Go: A Short History of Flint’s Coney Island Restaurants” by Florine, Davison & Jaeger (2007, Genesee County Historical Society), have not been tested but have been used as references in the development of more accurate recipes. Now, let’s get another thing straight: Your aunt, uncle, grandmother, second cousin twice-removed … They did not get that recipe for Flint Coney Sauce from the owner or a former employee of Flint’s Original. Your relative didn’t get it from Angelo’s or Tom Z’s either, they don’t give it away. And it probably has ground hot dogs in it as well, not beef heart, meaning instead that it came from the Flint Journal in the late 1970s. (It’s listed below as the Homestyle Flint Coney Sauce Recipe.) You, my friend, have been had. Forget what you think you know about Flint Coney sauce. There’s no ground beef or ground hot dogs in it. There’s certainly no tomato sauce or processed yellow mustard in it either. There might be kidney or other meats some restaurants may add to their own sauce, which is part of what makes each restaurant’s sauce unique. But to put it bluntly, many people have been overthinking it for too long. Someone created a “public” version of it that’s more complicated than is necessary. And more expensive as well. This is a more accurate version. Simple, inexpensive … and adjustable for personal taste. In the early 1920s Macedonian Simion P. (Sam) Brayan contracted with butcher Edward Abbott of Abbott’s Meats, Inc., to develop the original Flint coney sauce base, which Abbott’s still manufactures today and distributes through Koegel’s Meats. We’ve used a beef heart, some ground beef suet, onion, a laundry-list of spices, and clues located throughout the history of the Flint Coney, to do our best to recreate a recipe for Mr. Brayan’s original sauce using a batch of the real thing from Abbott’s Meats for comparison. It’s imortant to note that the Abbott’s sauce is marketed as a “sauce base”, and is intended to be modified if desired. Flint coney sauce developer Simion P. Brayan talked about a goulash that “contained parts of a cow that most Americans would declare positively yukky [sic].” He continued, “to make a better coney sauce, one should blend flavorful beef heart and kidney with the beef using beef suet as a base.” Such a dish doesn’t appear to exist anymore, so we developed this recipe from recipes we believe capture the spirit of the goulash he was talking about. 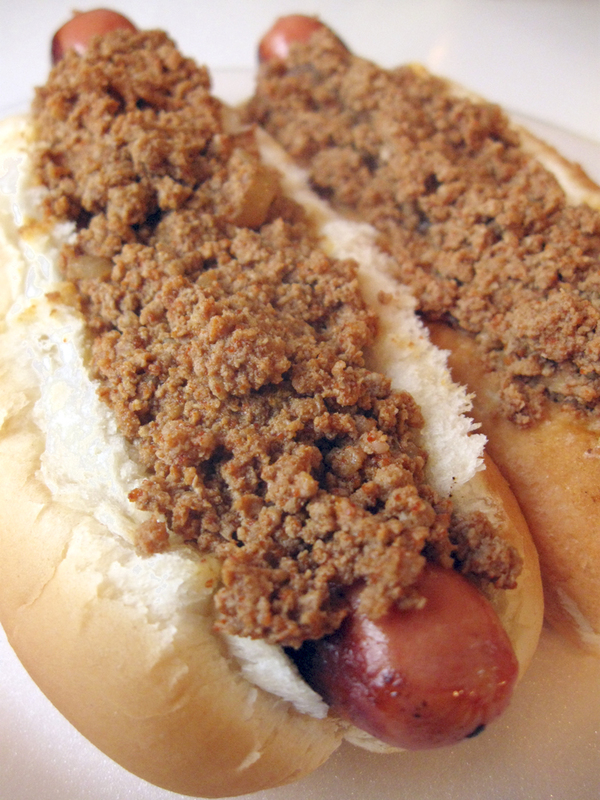 It turns out David Gillie of Gillie’s Coney Island in Mt. Morris, Michigan, published his Flint Coney Sauce recipe in “A Taste of Michigan”, a now out-of-print cookbook from the Michigan Restaurant Association. What’s interesting about this recipe is that David Gillie has told us he only made one change to his restaurant’s recipe for this version, also explaining what that change was. To our knowlwdge, this is the only Flint Coney sauce recipe available from an actual working restaurant. This is probably one of the most duplicated and modified recipes for the sauce. Posters constantly claim “This is the original!”, and the even more ridiculous “My [insert relative here] got this from the owners!! !”, which is patently untrue. (In our family, it was supposedly Aunt Fern.) Also, while a lot of people seriously love their Flint-style coneys, they tend to get a bit squeamish when you start letting them know there’s beef heart in the original sauce, and beef kidneys in some variations. 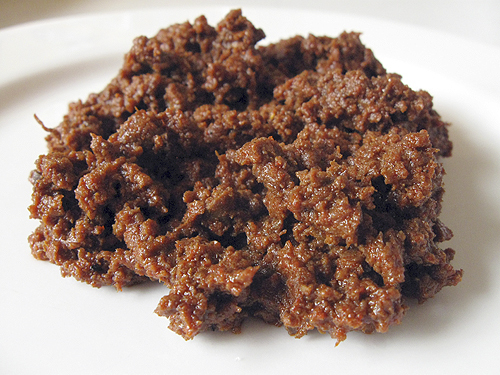 This recipe solves that problem: It uses a combination of ground beef and ground hot dogs as the main ingredients, with real lard and ground mustard providing body and a little “kick”. But it’s nowhere near the original recipe, regardless of the rumors and folklore. For years, I’d been making my own version of the Flint-style coney sauce. During the summer of 2008 over a period of three months the kids and I sold hot dogs with a sauce based on ground beef and ground hot dogs sauce, making 72 five-quart batches of my own version of the recipe. But while we all enjoy this sauce, both then and now, I’ve always had the urge to create my own version of the original sauce as served at Angelo’s in Flint using offal, or organ meats. This recipe is the result. Professional basketball player Marty Embry, who played pro in Europe for thirteen years, grew up in Flint and has been a coneyhead his entire life. After being trained by Tom Z at what is now Tom Z’s, Flint’s Original Coney Island, Marty has developed an extremely accurate sipce mix for use with some ground beef and some chopped onion. 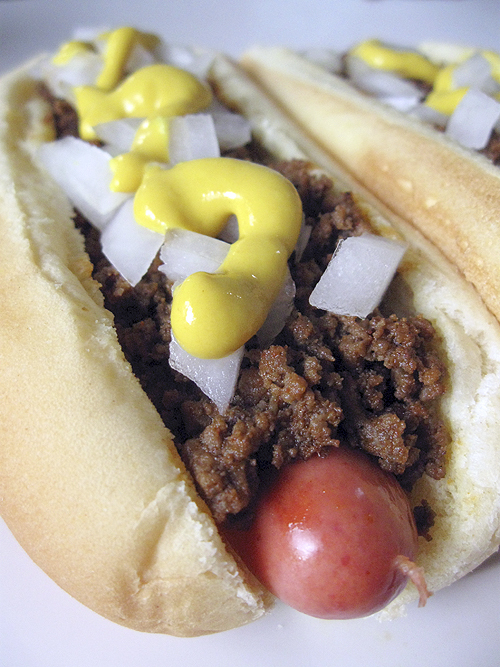 This makes a coney sauce that is extremely close in both flavor and texture to some of the more well-known Flint coney sauces available in the Flint area. In this test, we set up Marty’s sauce against sauce from Angelo’s for a direct comparison. Gloria Pitzer, aka “The Recipe Detective®“, was the original copycat recipe developer, creating her own versions of popular restaurant dishes and self-publishing 26 books on the subject with her husband Paul. A popular fixture on radio and television, she rubbed elbows with the people who operated those same restaurants, including Col. Sanders of Kentucky Fried Chicken, and many others. 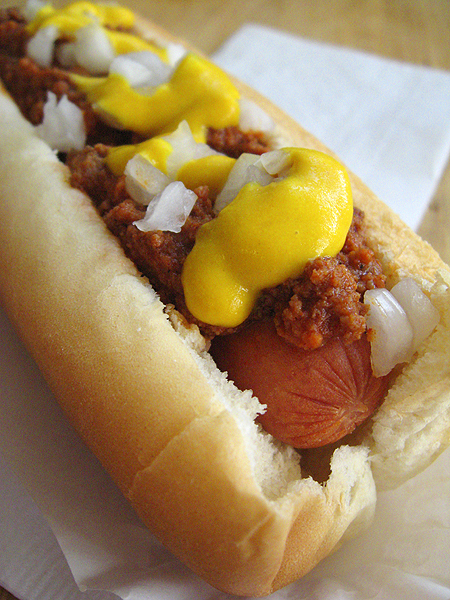 At one point, Flint Journal Food Editor Ron Krueger requested she take on Angelo’s Coney Sauce. She rarely took requests, but she did this one. This small clipping includes Pitzer’s very unique take on the recipe. I wrote this page in January of 2009. The Detroit Chili Sauce shown doesn’t seem to be available anymore. And when I actually did attempt the recipe at the bottom of the page, it was probably one of the worst things I ever put in my mouth. The info is included here just for historical context. If and when you come across this supposedly “original” recipe for Flint Coney Sauce on the web or in a book, using 50% beef heart/50% beef kidney, it isn’t it. The organ taste is quite strong and the aftertaste even stronger. I rarely throw away things I’ve made, but this one didn’t make it. This recipe is probably one of those that was posted to the internet before the person who posted it even tried it, and people simply assume it’s right. This is about as far from it as it gets.